Uttering the very notion of this parenting practice can whip my mom friends into a frenzy, with some being for it and others against it: but me, personally? I began my motherhood journey as a staunch adversary of co-sleeping. I was perched atop my high horse with my arms firmly folded: no, co-sleeping was not for us. As a mom with postpartum anxiety (and just being neurotic in general), the thought of co-sleeping made me feel very uneasy. 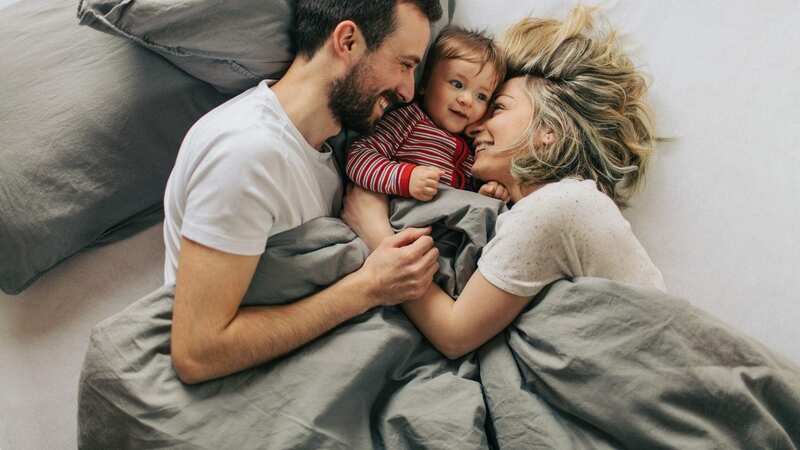 I’d done some research, and saw that co-sleeping was sometimes linked to SIDS; and anything with that horrible word in it was enough to make me want to take a blood oath against it. For the first 7 months of our girl’s life, she was an independent bassinet sleeper in our room, nestled safely into her mesh-sided slumber center night after night. Then, this homegirl had the audacity to go and get a mind of her own. Enter sleep regression, frustration, and feeling like the worst parents on the planet when our once wonderful sleeper wasn’t resting well, was waking up frightened, and getting grumpier by the moment due to lack of sleep—and she wasn’t the only one. We knew something had to be done, and when our high horse named “struggle bus” arrived at the stop titled “last resort,” we got off. We removed our pillows and blankets from the bed, pushed the mattress as firmly against the wall as we could (to close off any gaps—a hazard for little babes), and laid our girl down in the middle of our king sized bed one night, wringing our hands together as we watched her doze off. My husband and I stood there and listened to the rhythmic patterns of her deep breathing, and I suppose we eventually fell asleep, too. We all three awoke the next morning like we were straight out of a Disney cartoon movie. There were birds and music coming from somewhere; I’m sure of it. We’d all gotten a solid night’s sleep, and woke up feeling like new people. We woke up feeling like people that might co-sleep again the next night, and the night after that. It’s been nearly a month of this blissful state of being well-rested—when she wakes up in need of comfort or a bit of a snack, I find myself rolling over and able to provide that for her. We all feel so much better, and as a result, are functioning like normal human beings again. I felt awful initially for abandoning what I thought were my “principles;” I’d talked so much smack about co-sleeping that I was unable to actually admit to anyone that we were doing it, much less ask for guidance as we set about doing it. I’d never tried to intentionally shame anyone who was about that shared-bed lifestyle, but had inadvertently done so to one of my girlfriends. All of my proverbial finger-wagging had her feeling badly about her choice to co-sleep, and finding this out made me immediately want to crawl into a hole. I’d said things like “it’s selfish” or “dangerous,” when what I really meant and didn’t clarify was that it scared me. It scared me to think that my not-on-the-thin-side self could roll over and accidentally smoosh my squish. It scared me to think of things unspeakable, like SIDS, and those fears seeped into my conversations with friends who were co-sleeping. I’d always made it a point to never make people around me feel judged, yet here we were in the worst judgment territory: making another mom, who was doing her very best by her babies, feel inadequate. After making a long and sheepish apology to this friend, she half-smirked at me, saying “I knew you’d try it eventually. It sometimes just happens. You can worry all you want, but at the end of the day you’ll do what’s best for your girl”. Her kindness and compassion smacked me in the soul, and even though talks of moving to the crib have picked up traction in our household (as we’ve discovered, among many things, that co-sleeping with a baby means less co-sexing in our bed), we are secretly relishing these sweet nighttime cuddles. We’ve made our bed, we’re all lying in it, and that high horse we rode in on? It’s running around freely outside somewhere, hoping we don’t hop back on for a while.